Double-pane windows with low-e coating reflect heat back into the room during the winter. Most of us have heard about "low-e glass." After all, low-e technology has been used among windows since the mid-1970s, and every major window and door manufacturer offers low-e glass on their products. But if you're in the market for new windows, replacement windows, or replacement doors that contain insulated glass, it's smart to get up to speed on how low-emissivity films work, what the difference is between "hard-coat" and "soft-coat" versions, and how to make sure your new glass qualifies for different rebate programs. Dr. Energy Saver dealers are up to date on this technology and can easily apply low-e glass replacement windows in your home. Schedule a home energy audit or estimate for replacement windows and discover the advantages to this product for yourself! Improved energy efficiency. Windows can be responsible for 25% of a home's wintertime heat loss. In addition to reducing heat loss during winter months, low-e glass also reduces heat gain during the air-conditioning season. Less UV damage. By blocking most ultraviolet (UV) radiation, low-e glass helps protect fabrics, leather, carpeting, artwork and finishes from the fading effects of sunlight. Reduced condensation. Condensation on window glass can be a problem during the heating season, as warm air comes into contact with cold window glass and gives up its moisture, forming water droplets on the glass surface. Low-e glass will minimize or eliminate this unwanted condensation. Rebates on windows & doors. If you install new or replacement windows or doors that meet Energy Star requirements (which include low-e glass), you can be eligible for a tax credit. Other incentives may also apply, depending on different state and utility programs. Windows with low-e coatings reflect summer sunlight, keeping your rooms cooler. The "e" in low-e stands for emissivity - the ability to emit radiant energy. A dark asphalt surface has a high e-factor, while a low-e coating emits almost no radiant energy. The coating is actually an invisible metal or metallic oxide film that's deposited on the surface of the glass during or after the manufacturing process. This microscopic layer allows light (short-wave energy) to penetrate the glass, but blocks most ultraviolet (UV) long-wave energy, which we feel as heat. A "hard-coat" low-e application is done when the glass is in a molten state. The process results in a durable coating that can be used on storm doors and windows. A "soft-coat" low-e application happens after the glass is made. The soft coat is more efficient at reflecting heat energy, but also more delicate. 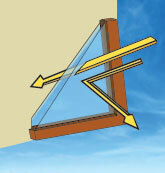 This low-e coating always faces the insulating airspace in double or triple-pane glazing. Since soft coat emissivity can oxidize when exposed to air, argon or krypton gas is often used in the insulating airspace to help preserve the coating. The gas provides an additional benefit: it's got better insulating value than air. Some glass manufacturers suspend a thin, transparent, low-e film between two pieces of glass instead of, or in addition to, using low-e coatings. This type of window can be even more effective at reflecting heat. Believe it or not, the location of the low-e coating has an effect on its energy-saving capabilities in different climates. In a hot climate, the low-e coating provides more home energy savings if it's on the outside layer of glass for an insulated window. 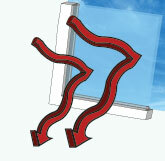 When retaining indoor heat is important, the low-e layer should be on the interior pane of glass. The Energy Star program has taken these and other factors into consideration in establishing qualification criteria for insulated windows, doors and skylights. The experts at Dr. Energy Saver will make sure you have the right windows for your area, not just for energy efficiency but also for available incentive programs. The Energy Star website contains a great deal of information about energy-efficient windows. This publication (available in PDF form) provides contact information and details on rebate programs offered by utilities in different states. However, the best way to obtain more information is by talking to your local Dr. Energy Saver dealer - schedule a home energy audit and discover all the ways you can save when you install replacement windows!